The weather around where I live has been really strange lately. Mother Nature can’t decide if she wants to go the sunny and humid as the Rainforest route or maybe the sunny and perfect weather route. Yesterday I actually saw lightning while the sun was shining! With that in mind, tonight I got home and thought, “Man, if only there was an activity that could one could engage in regardless of weather or location. If only there was SOMETHING I could do that wouldn’t involve a computer or some electronic device. Wait! Wait! There IS! It’s called…reading. 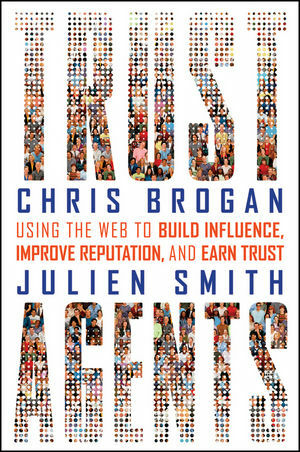 Top of the list is Trust Agents, Chris Brogan/Julien Smith, authors. I got Trust Agents, disgustingly enough, free of charge. I went to a Summit Up Conference in Dayton, Ohio last October and was lucky enough to see Mr. Brogan speak, and in my take-away bag was Trust Agents. Trust Agents was just a little baby book back then, but it has already exploded to “classic” status. I’d better get on this. As I read these “must” books, I plan on blogging whatever comes to my mind. Feel free to join in the conversation! Brogan & Smith talk about how amazing the first radio news broadcast must have been to people. Did they believe what they were hearing? If they did, it was probably because the voice they were hearing sounded authoritative and knowledgeable. Brogan & Smith then tie this “voice” to the game of being a trust agent. If there’s one thing I’ve learned from a great deal of drama from back in the day (not professional and VERY twenty-something), it’s that voice in the online world is extraordinarily difficult to read correctly. As a person who tends to speak from the bottom of a tub filled with sarcasm juice, I am acutely aware of this fact. If someone doesn’t know you but is reading your words, any sense of decorum you wish to bring to the exchange must reside in your words, which blink at the person from any number of machines. There is no intonation, and sometimes even emoticons don’t solve all of the problems that can arise because of this “voice” issue. The other difficult thing about voice in the online world is that we can all have multiple-personality disorder. To go back to the radio example, some of us would start out sounding like Walter Cronkite and then sort of meander over into sounding like a South Park character. This is because we converse in different ways depending on who we’re talking to and where we’re talking. I know a person who tweets like a moody adolescent and yet who spins pure gold in a blog. Which voice do you trust? Do you let the tweets turn you off, or does the blog lead you to look for hidden meanings in the tweeting style? It kind of makes me wonder if we should begin to semi-formally introduce ourselves to people, even though it would never go down that way. But it would be nice to know, on the front end, whether a person’s sense of humor is dry like the Sahara, potty-related, or absent. Do you get Monty Python references, or are you more a Miss Congeniality type? All of this frames out our voice, and how people read our online voice determines, I think, whether they will find us to be credible. Am I talking your language whether I mention Cartman or Friedman? Which reference makes you trust me more? Food for thought. Can’t wait to finish the rest of this second chapter!